When you consider God’s workmanship, is it difficult to acknowledge yourself? Lynn explains in her prayer to God. “For we are God’s handiwork” (Ephesians 2:10a). “. . . when God created man in His image to rule over all else that was created, God saw all that He had made, and it was very good” (Genesis 1:31a). I sit here in my home, weak in body but seeking You, Lord. I am Your workmanship, looking through a maze too full of how I feel to see clearly the truth of what You say. What is your “workmanship” that is “me” and that has become the relationship that is “us”? You don’t focus on my weaknesses in body or mind, although You hear and honor my prayer cries as they come to You. Is Your image slowly unfolding, much as the old style of a film negative needed to sit in transforming fluid until the clearer photo image came to full clarity? The fluids of pain and wonderings do not diminish You at work in my life. If I look at the negatives that can pound so hard, I will fail to believe–and sometimes see–the image You are unfolding. I will miss out on these present moments when You want to instruct and lead me. First, You created what You called, “very good” and next You have been instructing me on the paths where we journey together. When You spoke, “It was very good” it was me that You referenced. Greater than sky, sun, and the beauty of each flower–though great workmanships of Your hands–is the image of You that You placed within me when those words erupted. If I lie still in Your transforming living waters it is there where I will thrive–no matter my feelings. And the initial “it was very good” will one day become the very best You have seen from my beginnings. Prayer: Lord, thank You that You saw fit to create me for Your purposes. They are there to be discovered and will emerge with clarity as I keep my eyes on You. Amen. How do you refocus to God’s truth that when He formed You, He desired You to see yourself as his workmanship, one loved and of the highest value to Him? 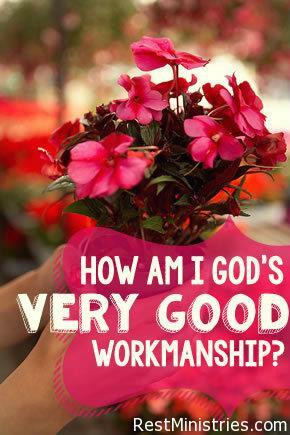 19 Responses to How Am I God’s ‘Very Good’ Workmanship? Once again, God’s timing is perfect. Just today I have to relinquish something I love. There’s a strong feeling of emptiness. Yet I know God is in the emptiness. I’m grateful for the reminder that, “The fluids of pain and wonderings do not diminish You at work in my life.” I’m so thankful that my emotions (though human) aren’t in control of my life. God is. And, yes, I can thrive within His plan for my life. Vicki – I am grateful for this message that came into my own life during a time of meditation with the Lord ( and my cries of wondering ). It seemed one I wanted to share. How fitting that it posts as we enter the Lenten season; one where often we seek a deeper focus on all the Christ went through in order to transform us – a work still unfolding in each of our lives. I am sorry to hear about the emptiness you are currently experiencing – we so want those times of surrender to end for there is much pain. But with Him, we do get through and hopefully are closer for being with Him more deeply at such times. Great devotional Lynn. God’s transforming power is awesome to see in our lives. Thank you for your kind comments, Karlton. We all need the eyes of our faith to trust that transformation is taking place. Sometimes God gives us glimpses and they boost our faith. Other times we are asked to wait – which tests our faith. But we do know He is at work! That is faith! I love how you describe that transforming fluid making God’s image to become ever clearer. So much hope in that. And how our workmanship is also in that “It was very good.” The Scripture lullaby is so soothing, too. Thank you, Lynn, for blessing me today. Trudy, I am grateful as I read your comments that a few thoughts within this devotional were of encouragement to you. As I said above, these were new thoughts to me and encouraged my soul and spirit – were a true answer to some prayer cries. To know they touched you, too, means so very much and that God is at work – transforming all of us. I also love the Scripture Lullaby series and it was Vick Chandler who introduced me to them. You can find more of them on YouTube and via their website at “Scripture Lullabies”. I often have them playing all day long because they do invade my apt. with peace! May you feel His “very good” words spoken to you often today! Diane – thanks for your sharings. How exciting that you have had the experience of developing film in the “dark room” and watching an image emerge. I can see how my thoughts would resonate with you from having had this experience! You always bless me – thanks for stopping by here to add to the basketful I already have from you! Powerful words of truth and you can tell you walk with God each and every day. Surely you are His workmanship – beautiful. Chris – how nice to receive your words of care. Lynn, last night I was watching a nature program about barn owls. The person talked about the intricacies of how silently they can fly in order not to scare their prey away. What a wonder! And yet, you and I, and all the human beings God has created have a much higher value in His sight. He desired to repair the great rift between us (because of sin) so much that He sent His Son to suffer and surrender to the hands of wicked men, who nailed Him to a cross. He died so that He could enjoy close fellowship with us. Wow!! Loved the Scripture lullaby too! Beth, thank you for leaving your comments. We ARE fearfully and wonderfully made and then, as you said, reborn through Christ’s sacrifice on our behalf so we could be reconciled to Him. His work is completed. We move onward solely by His grace. It is overwhelmingly wonderful! Thanks for sharing your thoughts and prayer with us Lynn – a wonderful reminder that we can get stuck on seeing our own situations as “less than perfect” when God created all things “in His image” – and that was good. Fiona – thanks for your comments. I know how easily the noise of my pain and “what ifs” can take over my thoughts. I know God is not in the “what ifs” but in the present “now”. I know remaining with Him is where I want to be – or certainly return to as soon as I can when I drift off. May we each – for we all long to – keep letting Him woo us back to that deep place with Him. Oh Lynn, your devotional spoke so powerfully to me. I am in a time of big changes, and I am having to let go of many things that were “me.” But is I allow myself to rest in the Father, I am seeing that in a way, I am becoming more of the “me” he created me to be. Because I am moving out of His way. His light shines through. Sandy, I admire you so for indeed, you are going through many transitions as your challenges get more intense. That the thoughts in this devotional encouraged you, lightens my heart. You are a light reflecting His Light into many of our lives. Love you to pieces, my friend! Thank you for making me cry- – it’s a good cry, though! Our God is just so awesome and you are so right–there are no mistakes. He loves us as we are even if we “feel” a mess. But what touches my heart so much is that He not only loves us but like you said He says “we are very good”. Thank you so much for this devotional! Cindy – so touched by what you shared. There is a crying that becomes a cleansing crying – or crying that helps us wash out the pain and can be replaced with some truth not seen in quite that way before. May you have more moments of peace ( with or without crying! ).